Use these instructions for any oval, boat-shaped, tapered, or table that doesn't have straight sides. Pull your table apart slightly. If your table does not open in the middle please contact us for further instructions. Spread a piece of paper over half the table, hanging down over the edges. 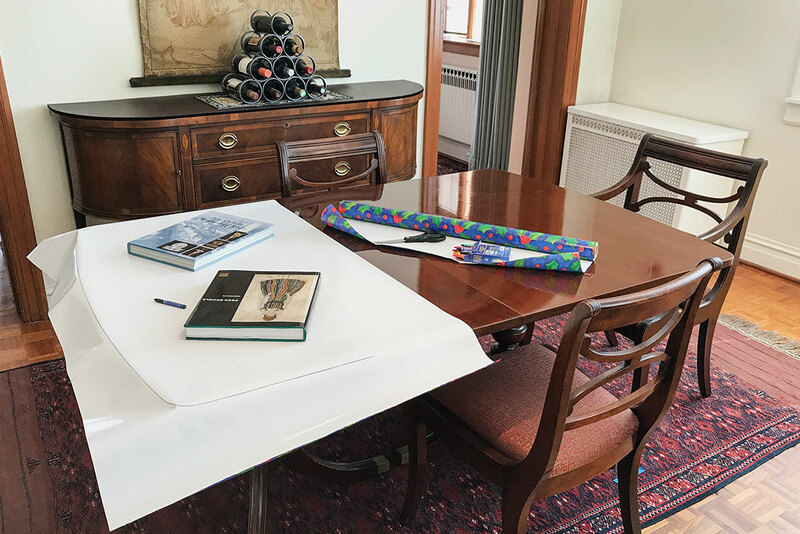 You can use wrapping paper, brown paper or taped-together pieces of newspaper (No plastic, cloth, or tissue paper). Please do not cut out the pattern. Smooth out the paper so that it lies flat and place a few books or other weights on the paper to keep it from sliding. Holding a crayon or pencil flat (do not use a marker or pen), run it along the center crack and all the way around one end of your table. 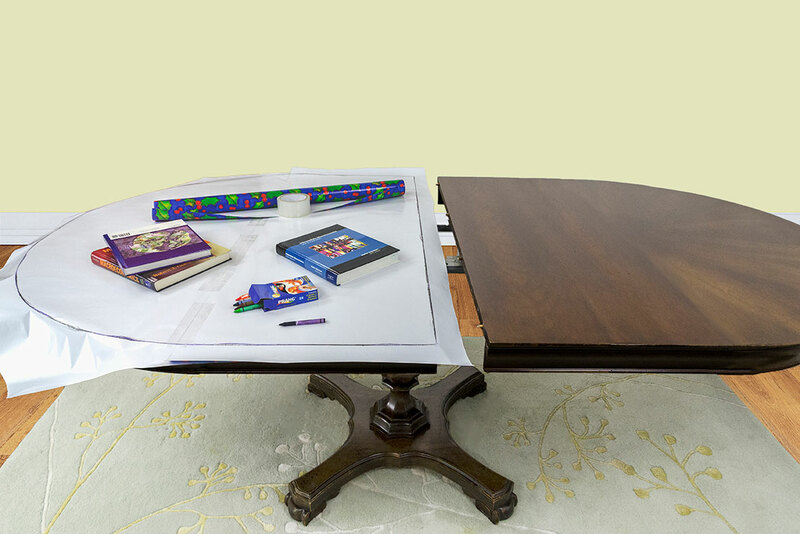 Trace the edge of the top flat surface of half the table - do not include any bevel or edging. Fold up the paper and write your name and order number on it. Please do not cut out the pattern. Send it to us at Superior Table Pad, 3010 N. Oakley Ave., Chicago, IL 60618. Use these instructions for any table that has straight sides and any shape on the ends. Spread a piece of paper over the end of your table, making sure you give us several inches of the straight sides. You can use wrapping paper, brown paper or taped-together pieces of newspaper (No plastic, cloth, or tissue paper). Please do not cut out the pattern. Holding a crayon or pencil flat (do not use a marker or pen), run it along the edge of your table on top of the paper. Trace the edge of the top flat surface of the end of your table - do not include any bevel or edging. Lay a piece of paper over one corner of the table, make sure the paper hangs over the edges of the table slightly. You can use a piece of printer or copy paper. Place a book or other weight on the paper to keep it from sliding. 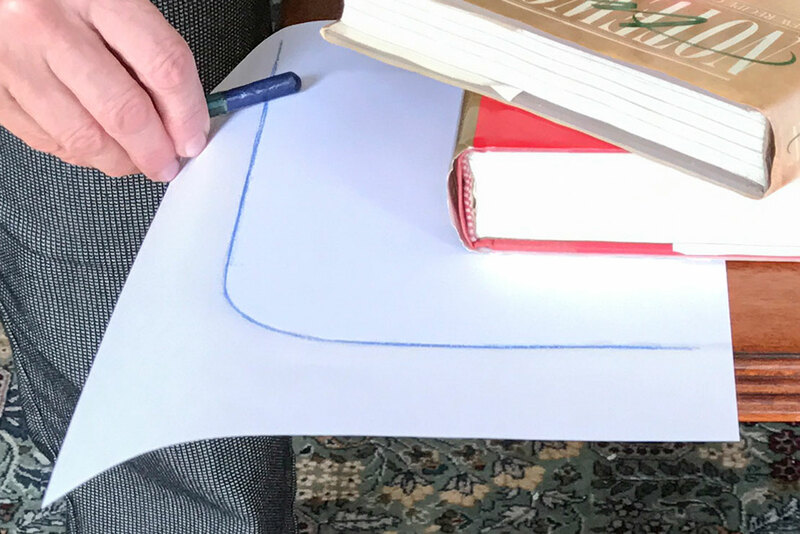 Holding a crayon or pencil flat, trace a couple of inches along the side of your table, around the corner and a couple of inches along the end of the table - do not include any bevel in the tracing. We need the shape of the corner and several inches of the straight part on each side included in the pattern. 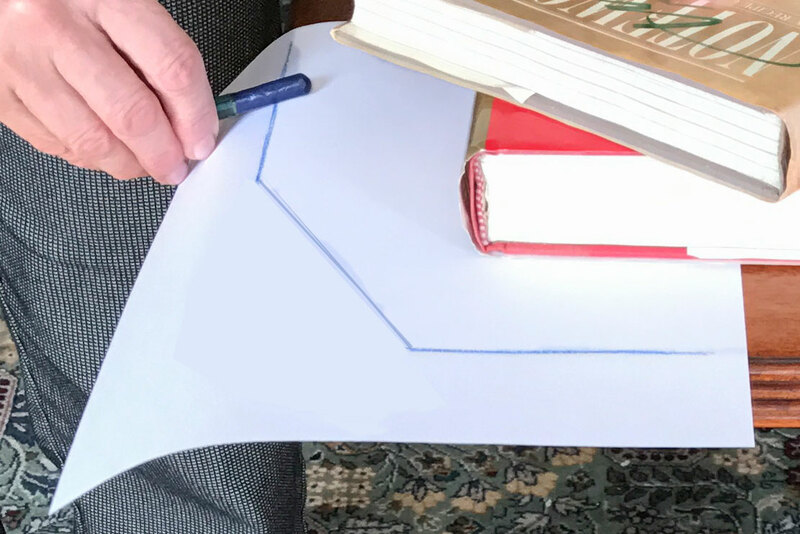 If your corner is too big for this to fit on one sheet of 8 1/2” x 11” paper you will need to tape a couple of sheets of paper together. If you need to use more than one sheet of paper you will have to send the pattern by regular mail only. Write your name and order number on the paper and fax it to us at 888-225-3723 or send it to us at 3010 N. Oakley, Chicago, IL 60618. If you prefer, scan it and email it to us at service@superiortablepad.com. Please make sure you save your scan as a PDF file only. If you scan the pattern only use a flat bed scanner. A scanner app on a phone or tablet will not provide an accurate pattern. Do not convert the file. A jpg file converted to a pdf will not work. A photo of either the corner or the pattern will not work. ©2019 Superior Table Pad Co., Inc.